It’s time to sound the alarm bells on prospects for the Millennial Generation in three of the world’s most important advanced economies. In the US, UK, and Japan, the generation of citizens aged 19-35 are the first in modern memory on course to be worse off than their parents. To take perhaps the most striking example, roughly half of Japanese Millennials aged 20 to 29 in 2015 reported still living with their parents. In crucial recent votes in the US and UK as well, the 2016 presidential election and Brexit, Millennial turnout was significantly lower than for other generations, despite the fact that the young will experience proportionally greater impacts from each of these votes through the prime of their lives. In the US, Millennials’ greatest challenge is likely their daunting student debt obligations. A majority of US Millennials have student debt, and those Millennials who graduated in 2016 face the prospect of paying off an average per capita record-setting $37,712 in student loans. Such high debt prevents many Millennials from taking steps that are traditional markers of adulthood, such as purchasing homes and starting families. Millennial incomes have also fallen dramatically compared with previous generations. Millennials in 2013 had median earnings that were 43 percent lower than that of Generation Xers in 1995, when Gen X was at a similar point in its demographic development. In addition, financial insecurity is making US Millennials less entrepreneurial than previous generations. Recent studies indicate that the share of people under 30 who own their own business is at its lowest in 24 years. Given such poor economic conditions, it is unsurprising that US Millennials have returned home, becoming the first generation in modern US history to primarily live in a multigenerational home. In the UK, housing affordability and employment opportunities are the most pressing issues for Millennials. While student debt is also an issue, the rapid rise in home prices in the UK has proven to be far more serious. Millennials have found themselves priced out of starter homes, as housing costs outpace income growth. Median income for most Millennials aged 22-30, for instance, is 8 percent lower than it was before the global financial crisis. Unemployment and underemployment also remain high, despite recent economic improvements. Japanese Millennials face likely the most dire economic circumstances of this trio. The country’s GDP growth has been largely stagnant for nearly two decades and Millennials face an inflexible labor market. Nearly 30 percent of those aged 25-34 in 2014 said that they settled for temporary work because they couldn’t find permanent employment. This economic hardship is reflected in Millennial attitudinal surveys. While global Millennials are generally optimistic about their future careers, fewer than 40 percent of Japanese Millennials are, and more than a third expect to have to work until they die, largely to support Japan’s outsized elderly population (the inverted demographic pyramid). 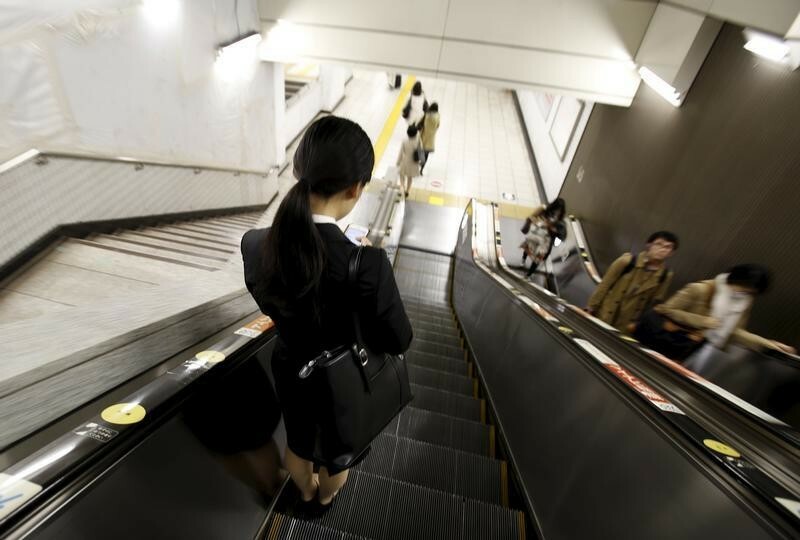 A student job seeker rides on an escalator inside a train station at a business district in Tokyo, Japan, March 31, 2016. Public and private sector leaders have taken steps to engage with Millennials. Since entering office, President Obama, as well as former British Prime Minister Cameron, have made communication with Millennials a significant part of their communications strategy, while Prime Minister Abe has leveraged economic reforms to improve youth economic prospects and has made significant strides in increasing female labor force participation. Even so, such outreach failed to translate into significant Millennial political turnout in the United States and United Kingdom. It’s a self-fulfilling prophecy, but if Millennials don’t vote, then politicians won’t reach out to engage with them, and if Millennials feel forgotten and only see the older generation in politics, they’ll disengage from politics and not vote. Many businesses have also attempted to engage with and adapt to Millennials’ preferences to retain key talent, as evidenced by increasing flexibility and emphasis on work-life balance at major corporations in the UK and US. In addition, businesses such as GE and BAE Systems have developed mentorship programs to prepare Millennials for corporate leadership positions as Baby Boomers retire, incentivized by rapidly shifting labor market demographics. Leadership, communication, and mentorship, though important, won’t be enough if structural problems continue to limit Millennials from reaching their full potential. To address this, policy leaders, need to act to level the playing field for Millennials to be as successful as the older generations. 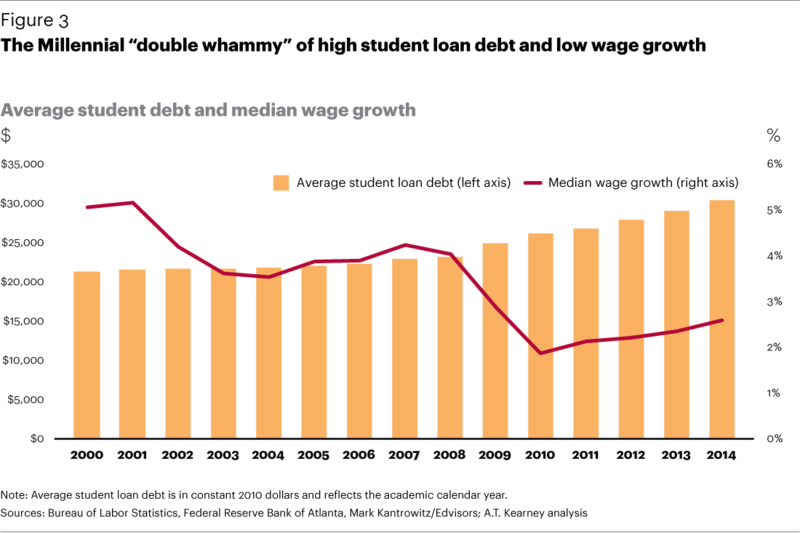 Most importantly, policy makers must tackle the thorny challenges of debt, specifically education debt, and housing affordability. Once debt is under control for Millennials, they still need assistance in making sure their career path doesn’t suddenly hit a wall. As the world faces increasing shifts in the demand for skills and labor, Millennials especially, but other generations as well, need assistance to stay employed until retirement. Often times this will mean government or corporate retraining programs to fight underemployment and assistance if open trading policies cause job losses. Without courageous and forceful action from business and policy leaders, Millennials risk becoming the latest lost generation.